Hello and Happy New Year, dear Themza friends! We’d like to take advantage of the possibility to wish you a really successful new year full of positive surprises and ‘open-source discoveries’. The new 2009 found us working on the latest addition to our expanding collection of Moodle themes and here it is now – the brand new Digital University theme readily available for you on our website. The theme is characterized by a clean design and a banner area decorated with cyber effects representing the remarkably efficient collaboration between higher education and advanced communication technologies. We hope that putting a start of the new creative year with an educational project will keep us charged with the enthusiasm and inspiration of a diligent student throughout the forthcoming 12 months This will surely have its positive effect on the quality of the free templates for Joomla, WordPress, Moodle, 4images we’ll be releasing for you this year. We are as well planning to expand the list of script categories, so stay tuned for the launch of our Mambo and Drupal projects in the foreseeable future. 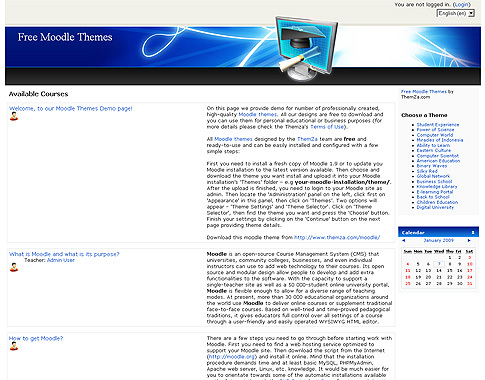 This entry was posted on Wednesday, January 7th, 2009 at 3:46 pm	and is filed under Moodle. You can follow any responses to this entry through the RSS 2.0 feed. You can leave a response, or trackback from your own site.